The Belfast-made Civil War-era quilt. 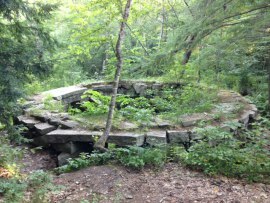 Portion of the remains of the Gambo Gunpowder Mill. In Gorham and Windham, the Gorham Arts Alliance, Baxter Memorial Library in Gorham, Windham Public Library in Windham, RSU 14 (Windham/Raymond), Gorham Historical Society, Presumpscot Regional Land Trust and Windham Historical Society collaborated on a project encompasing both towns that focused on the Gambo Gunpowder Milll, which spanned the two towns and played a vital role in supporting the Union Army during the Civil War. The two townscreated opportunities for collaboration between their populations, and specifically reached out to students.The team designed a website and created a Facebook page entitled: A Tribute to Our Towns in the Civil War: Gorham and Windham, Maine. Fifth grade students in Windham raised over $450.00 to help purchase Maine-made, hand-forged GAR markers which they put on the graves of Windham Civil War Union soldiers. Gorham High School drama students wrote, directed and performed in an original theater piece which was based on a letter acquired from the Windham Historical Society regarding a boy from Parsonsfield who worked in the Gambo Gunpowder Mill. Photos of Civil War Masonic graves in Evergreen Cemetery, taken by My Place Teen Center students. The Portland/Westbrook project was a collaboration between the Friends of Evergreen Cemetery, Walker Memorial Library in Westbrook, My Place Teen Center in Westbrook, and Masonic Civil War Library and Museum. Their overall goal was to create a community “alive with history” and bond the neighboring communities of Portland and Westbrook. The unique story of Evergreen Cemetery, along with Memorializing Civil War Veterans was the focal point of the project. Young people from My Place Teen Center were introduced to Evergreen Cemetery’s Civil War history and learned how to photograph and document monuments and memorials.In addition, the team’s final event, a Memorial Day Procession was wildly successful with over 400 people lining the street for the procession and filling the Wilde Memorial Chapel to capacity (105) for the Decoration Day program. Kim Smith of Presque Isle Historical Society shows off a Civil War document in their collection. The Presque Isle project was a collaboration between the Presque Isle Historical Society, Northern Maine Community College (including the E. Perrin Edmunds Library), MAD #1 Presque Isle Middle School and Mark and Emily Turner Library in Presque Isle. The partners highlighted the impact of the Civil War on this remote and rural northern Maine community despite the distance of actual Civil War battles, and in the process they built interest in local history as a way to connect students to the larger community. Presque Isle in the Civil War looks at how one town memorialized the dead. A wide cross section of community members came together to discuss four books: The Mostly True Adventures of Homer P. Figg, Soldier’s Heart, This Republic of Suffering and A Vast Army of Women. While discussing Soldier’s Heart eighth grade students and veterans had a far ranging discussion on war and the people who fight and those who are left behind, from the Civil War to the present day. For both their kick-off and final events the Presque Isle Historical Society created a hands-on exhibit at NMCC. Additionally, the team stocked 4 Little Free Libraries with Civil War books to entice people to become fully immersed in the Civil War.